Megahertz provides two SNG satellite trucks for STV in Edinburgh and Glasgow. London, UK, May 2016: Megahertz Ltd. has won a contract to provide two new SNG trucks for leading Scottish channel 3 broadcaster, STV. The trucks will be based in Edinburgh and Glasgow. The unit for Glasgow is also fitted with a 70cm Dawson Ka-band dish for IP connectivity, allowing the journalists to log in to STV's iNews network. The Edinburgh unit is equipped with an LTE router for connector to the mobile 4G network. Both will also create a local hub to allow the crew to connect mobiles and tablets. The video and audio architecture includes Blackmagic hardware, Courtyard SPGs and Rohde & Schwarz test equipment. As well as RF connectivity to the camera, a Telecast Copperhead fibre system is also on board. "Our SNG trucks are in constant use and we need systems that are fast to set up and highly reliable in operation," said Sam Dornan, channel operations manager at STV. "For these two units, Megahertz provided a bid that showed they understood the full complexity of our technical requirements, including the subtle differences between the two." Steve Burgess, technical director at MHz, is acting as project manager on this project. 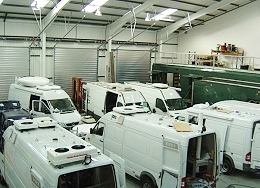 "We have had a huge amount of experience building SNG vehicles recently, but it is really important to remember that every broadcaster has a different set of requirements. This project provided us with a great opportunity to put to test our team's fantastic problem-solving skills and we have really enjoyed creating an intelligent solution for STV."